(TRN) — U.S. Department of Defense satellite imagery has detected the arrival of more than thirty (30) Russian nuclear bombers to the airfield adjacent to Russia’s Borisoglebsk national level nuclear weapons storage facility (Voronezh-45) and has observed numerous transfers from the storage facility to the aircraft, which are now standing-by along the two runways at the airport. According to sources from the National Reconnaissance Office, yesterday there were only two Bomber aircraft at the airport to the east of the storage facility. 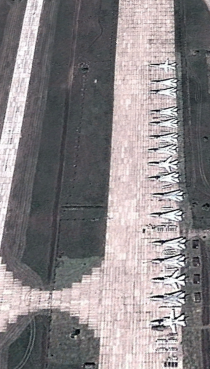 This is typical for this facility and those aircraft can even be seen on old images used by Google Earth, HERE. 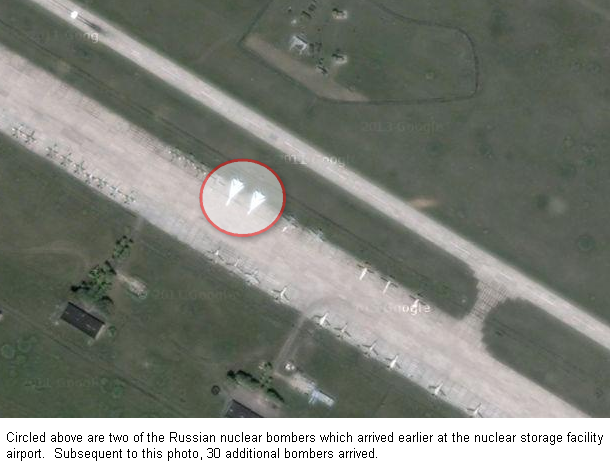 Early on March 5, U.S. satellites captured an image showing many bomber aircraft had arrived at the base. Later on March 5, a U.S. stealth surveillance drone, flown over the Russian base, showed more than thirty (30) such nuclear bomber aircraft had arrived at the airfield. Numerous transfers were observed by U.S. satellites, between the nuclear storage facility and the newly arrived aircraft. Those aircraft remain on the runway at the local airport at this hour, several with what appear to be Auxiliary Power Units (APU’s) attached, indicating the aircraft are on ‘stand-by” for immediate deployment. Clearly, Ukraine poses no threat whatsoever to Russia, which begs the question: What is Russia preparing for? They certainly are not going to bomb Ukraine with 30 nuclear bombs, so what other targets do they have in mind; western Europe? Just days ago, Russian Foreign Minister Sergei Lavrov made clear to the west that Russia would retaliate if the west imposes sanctions upon Russia, and in a cryptic message, Lavrov stated that such retaliation “would be asymmetric.” The definition of “asymmetric” is: having parts that fail to correspond to one another in shape, size, or arrangement; lacking symmetry. Launching multiple nuclear attacks against multiple countries in western Europe would certainly be asymmetic. Perhaps this is why ham radio operators have been reporting a very unusual number of Emergency Action Messages (EAM’s) being broadcast to U.S. Naval Vessels worldwide today, on frequency 8992.0 KHz. The EAM’s are, of course, encrypted, so we do not know what Emergency Messages are being FLASHED to U.S. military around the world, but we now have a sense of what the subject matter may be and it is frightening. More details if they become available . . . .